Miyoko Schinner is a vegan rock star. The Northern California–based vegan chef, author and entrepreneur gave us the Now and Zen UnTurkey, UnChicken and UnRibs in the 1990s, and now she’s wowing cheese lovers nationwide with her artisan vegan alternatives. Launched in 2014, Miyoko’s Kitchen offers 19 plant-based, dairy-free cheeses, spreads and butters—all non-GMO, cholesterol-free, hormone-free and pesticide-free. 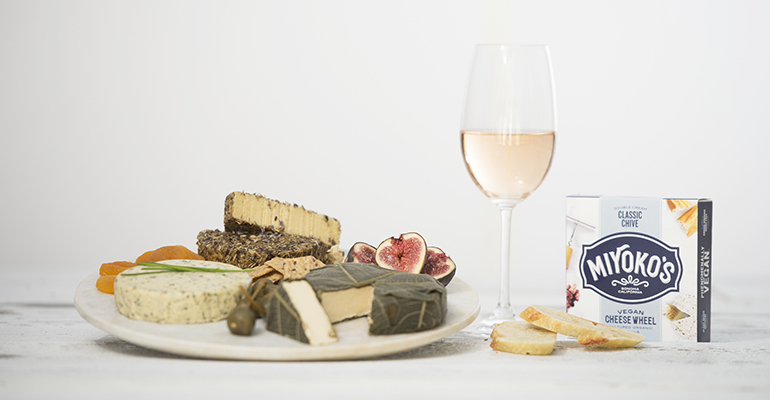 Schinner, who believes her mission is building “tomorrow’s creamery,” sees a bright future for vegan cheeses and encourages retailers to go all in on the category. We recently scored some time with Schinner to learn more about her path to veganism, her company’s mission and what’s in store for this fast-growing market. How did you first become interested in veganism? Miyoko Schinner: It was the mid-1980s. I was already a vegetarian because I didn’t want to harm animals, but I always had stomach troubles too. Then it dawned on me that maybe dairy was the cause. I tried giving it up and, sure enough, my stomach woes went away. Then I was plant-based for a number of years—an evolving vegan—but I had a hard time turning down a beautiful platter of cheese. Give me that stinky limburger and beautiful brie! But after learning about the dairy industry, I had to make the commitment to not eat dairy at all. It was very hard. What was I supposed to have on Friday night with my glass of wine? To me, that was the good life, so this was a conundrum. I went on a quest to find tiny bites I could enjoy with wine. At first these didn’t involve cheese. But when I opened a restaurant it San Francisco, I perfected my vegan recipes over the years. How did Miyoko’s Kitchen come about? MS: I wrote a book called Artisan Vegan Cheese in 2012, and it became a cult classic. I would often make these recipes in my home and take my cheeses to parties. One year, I took some to a Tofurky party at Natural Products Expo West, and after eating my cheeses, my good friend [Tofurky founder] Seth Tibbott said if I turned this into a company, he’d be my first investor. I was a serial entrepreneur but had never been super successful, so I was not planning to go back into business. Seth gave me the inspiration to do so. What key ingredients are used in your cheeses, spreads and butters? MS: Right now, the key ingredients are cashews and coconut. We are considered a very premium line, so we’re more expensive than others. But what distinguishes our brand is we use natural fermentation as the main driver of flavor; we don’t add things to the cheese to get flavor. We are playing around with other substrates that are less expensive than cashews—things like legumes and grains—to make a lower price point for more mass appeal. Our new cream cheeses are our first foray into a more everyday line, products sold for $5.99 versus $10.99. Are there nutritional benefits offered by dairy cheeses that yours do not deliver? MS: That’s an interesting question, but it belies a myth about dairy cheese. Dairy cheese ranges hugely nutritionally, depending on the type. Some are much higher in fat and lower in protein than others. Also, unless it’s organic, dairy contains a high percentage of antibiotics. And whether it’s organic or not, dairy is high in IGF-1, a major growth hormone and contributor to cancer. It is also high in casomorphin, a naturally occurring opiate in mammalian milk. People don’t really consider all these aspects of cheese, so ultimately we are not trying to be dairy. We are trying to create something better than dairy, something that will provide nutrition, fiber, no pesticides and no hormones. Do you aim to mimic the taste and mouthfeel of dairy cheeses? MS: Yes, we try to make our products as much like cheese as possible to give people the satisfaction of eating cheese so they can transition to better-for-you products more easily. People will often ask, which one is most like cheddar? Which is like Jarlsberg? That’s not exactly what we’re trying to do—we’re more trying to mimic different attributes of a range of cheeses, such as soft and creamy or hard and robust. What was your experience breaking into retail? MS: We were an e-commerce business initially because we wanted revenue right away. It was always our plan to move into retail, but I had been out of the industry for so long and had heard it was much harder to get into distribution today, so I wanted to start online. We were successful from day one. The very first weekend we had $50,000 in orders, which shows there was a lot of pent-up demand for our products. Three months later, we started retail distribution just in Northern California because of a local forager program with Whole Foods. We initially planned to open a small retail shop in West Marin, but that became our e-commerce shipping center instead, although we’ve since moved to a larger location. Plant-based diets are increasingly popular. Do you expect this trend to continue? MS: Yes, I think this is the future. All studies show that, too. At a recent Protein Trends & Technologies Seminar, where I was the only vegan, every speaker talked about plant proteins as the future. They discussed how animal protein is just not sustainable for the environment or anything else. Is the plant-based cheese market getting crowded? MS: Go look at a dairy cheese set. It’s a huge section, while vegan cheese is only a couple of shelves. For the category to grow, we need more vegan cheeses of different qualities and styles. Ten years ago, there was Silk and maybe a few other brands of almond milk, and now there are more players than ever and they are taking up greater and greater market share. The same thing will happen with cheese. And it won’t be one company that takes over the set—it will be multiple companies. This is supposed to be a $4 billion industry by 2024, and for us to get there, we need even more players and a wider range of innovation. And yes, Miyoko’s Kitchen wants to be a dominant player in the category. We will continue putting a lot of resources into innovation. Any advice for independents for selling your products and uplifting the whole category? MS: This category is rising at 30 percent to 40 percent every year, according to [a provider of consulting services for the natural, organic and specialty products industry] SPINS, whereas conventional [dairy] is flat-lining or declining in sales. Retailers should really pay attention to these trends and give more shelf space and visibility to vegan cheese. The more shelf space you have, the more products you’ll move. And don’t think, “Oh, we have a few brands; that’s enough.” No. Offer variety. It’s also best to create a vegan subset within your dairy cheese space to build awareness, because people who eat dairy won’t go to the alternatives section to look for vegan cheese. Yet these are the consumers who are really driving growth because they are lactose-intolerant or trying to reduce their consumption of animal products. In fact, most of our customers are not vegan but flexitarian. Just promote the heck out of vegan cheese, and I bet you will sell a lot. What else should retailers know about you and your company? MS: Like many other plant-based companies, we are in it for the mission, not only sustainability but also to save the lives of other living beings. To that effect, I also have a 17-acre farm-animal sanctuary, which is a nonprofit. We rescue cows and goats and pigs taken out of animal agriculture. We offer tours and visitations to help people connect with where there food almost came from but didn’t. We are very excited about the future of plant-based eating and where it’s heading.